Lakewood wins its first home game! Friday, October 12th, 2018: A night to remember. Lakewood Varsity Football took on the Westlake Demons for the 8th game of the season. Fortunately, Lakewood came out on top with a final score of 35-26. The rain poured hard, but our team played harder. Although we won, the Demons were the first to score. The quarterback for Westlake threw a 27 yard pass for them to score. 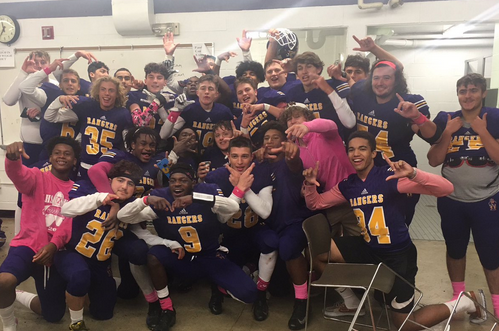 Lakewood knew that they could not go the first quarter without a score, so they made it happen. Rangers were on the 2 yard line and Dwighski Jackson ran the ball in for a touchdown. This was the first time yet this season the Rangers have scored in the first half. By the end of the first quarter the Rangers were up 14-7. During the second quarter of the game, Lakewood came out to score again. Quarterback, Albert Wilhelmy threw to Phoenix Jouriles from the 44 yard line to score for the third time this game. The team then attempted to go for a 2 pt. conversion, which was complete. At this point, the crowd was as hyped even in the rain. Westlake responded to our lead by rushing for a 5 yard touchdown. By halftime, the score was Lakewood 21 and Westlake 14. After halftime, there was no action for quite some time. Close to the end of the quarter Wilhelmy for Lakewood threw to Milan Jackson at the 37 yard line for a touchdown; this increased our lead, which is just what we needed to stay confident. Westlake came back with a running touchdown, but their extra point was no good! It was the fourth quarter of the game and both teams were eager to win. Each team came out and scored once more, making the final score of the game 35-26 Lakewood. It was what you call a perfect ending to a rainy night.